We regularly fundraise to participate in charity endurance events such as half marathons, marathons, and bike rides. 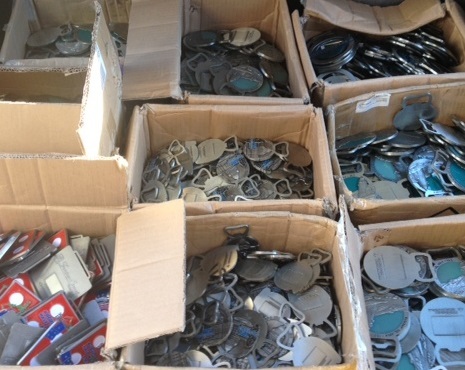 We saw that local and regional race directors had boxes of unclaimed or extra race medals (from either over-ordering or from cancelled events), and were just throwing them out. We also heard from people who had sports or academic medals that they had collected over the years and no longer wanted. They were looking for something they could do with them instead of throwing them in the trash. Rather then letting all these extra and unwanted medals go to landfills, we work with a local scrap metal company to get these medals recycled. We also work with local textile recycling to get any ribbons recycled (the ribbons are shredded and become insulation, carpeting or other textile products). We bring any plastic bags, bubble wrap, paper, and cardboard packaging to appropriate facilities to get recycled. We've helped reduce the environmental impact of road races, while raising money for race-related charities that we care about. We have recycled over three tons of sports and academic medals and ribbons to date! All proceeds go to the fundraising goals we have for charitable athletic events that we would normally ask friends, family members or businesses for donations for. If we're not currently fundraising for something, we've donated to others. We have made donations (either participating ourselves or to others fundraising) to the National Multiple Sclerosis Society (through Bike MS), My Team Triumph, the Leukemia & Lymphoma Society (through Team in Training), Team Lupus (through a Boston Marathon charity entry), and more.